Automated marketing has brought in thousands and thousands of dollars for our clients. We use Messenger bots and Facebook ads. As people who run an online business, we often hear about plug and play automated systems that will create a cash machine. It might not be a popular opinion, but often times… automated marketing does not actually work. Our audiences are more savvy than ever, and honestly, they deserve more than a bunch of automation without human connection. You may think this sounds crazy coming from me – because I LOVE AUTOMATION. Marketing Automation. And, I recognize that it's not a magic pill. But automated marketing is a PIECE in the puzzle. We use a super specific clear system to make it happen – AND – there are loads of minute tweaks that need to be made in order to really ramp it up! So… that brings to mind the question… what else is required to get this automated marketing stuff to WORK? I've recently dug in and identified 7 things that the systems that REALLY work have in common. I walk through each of them below. It's reeeeall good! You will LOVE THIS! Navy Seal Quote: “Slow is smooth… and Smooth is fast”; this means to slow down and learn things or do things right… then when you do them fast they will be done with accuracy and not make a big’ole mess. Testing is a step that makes things “smooth” use your team to test, your clients to test, heck friends and neighbours if appropriate but test. As Alane says: “slow down to speed up”. Get more eyes on it… whatever “it” is; your process; your product; your course; your [fill in the blank]. Your list and your people are made up of real human beings so take the time to do it right and get “smooth” with your thing so when you crank up the speed to production speed you are not making a mess but everything is running smoothly! Be clear of the *tangible problem* you are solving for your audience; this helps to personalize your marketing automation. You have solutions to your audience's problems but the problem in social media is communicating that clearly. Be super clear on two things: 1. WHOM you are talking to. Have a clear picture in your mind of whom has this particular problem. 2. WHAT actual and tangible problem you are solving. This becomes really important when you get to running FB Ads; if you are not clear you are wasting money on Ads that fall flat; FB Ads work but you have to work them with clarity on those two things: WHOM you are talking to and WHAT tangible problem you solve. Offers: When you go to make offers and you have this clarity… they are going to be specific! Yay! Specific offers are paramount to your success. This is a necessity and is not trivial; like I said above you have to identify the problem you solve and my point here is to specify a *tangible* problem. You don’t solve “any” problem; the word “any” really means nothing and noone because it falls on deaf ears… but when you get specific and “tangible” you peak people’s interest. When you do this you give people a reason to show up on your broadcasts and pay attention to your ads etc. You need to articulate the direness of the situation; this turns people’s heads. You can’t set it and forget it; that is a common phrase these days and you miss connecting with the real humans when you set it and forget it. 4. Follow Up is key for Automated Marketing to work! A key point here is that… when you follow up… do it as a real human being; I can’t say this enough. Automated marketing needs you to think in terms of real human beings. Specific things need to be done to make the follow up happen. Realize this follow up is the moment you are building a real relationship with people. Boundaries: you need to have them; you need to set them; you need to follow them enough said. Social proof can be gained by good folks showing up on your broadcast and in your social media; harness this and highlight it. SYSTEMS: this is important. When you follow up you need to have a system in place as you do it; We use Asana, it is a project management tool that is great. We can put everything we are doing in it and assign follow up tasks and actions for everyone on the team; if you are just one person it can help you as well. Just use SOMETHING to keep track of what you are following up on. Get a system in place. If you want us to do a review of your systems, and show you where you might be be able to make a tweak that shifts everything in the right direction, let’s jump on a call and make that happen! Are you not getting the results you want? It is likely because you are not seeing or at least capitalizing on the opportunities that are there. It is important to not miss; pay attention to what is going on and capture the opportunities because when you do you can convert existing clients to your next level of service; Pay attention to this as this is what grows your business. Don’t let the technology of FB cause you to miss an opportunity; for example with connecting with people. Realize there are two forms of Messenger: one on the Facebook platform; one on the Messenger platform itself. If you get off your desktop and use your phone you can get around this; go into the Messenger App itself and click “Add on Messenger”. This is ninja because the Messenger app is it’s own platform and you can bypass the dreaded “Other’s” folder and connect with people you are not friends with as yet! That is pretty cool! This is a big one… we generally don’t reach out enough. You have a list… use it. If you have not made a list… make one… then use it! 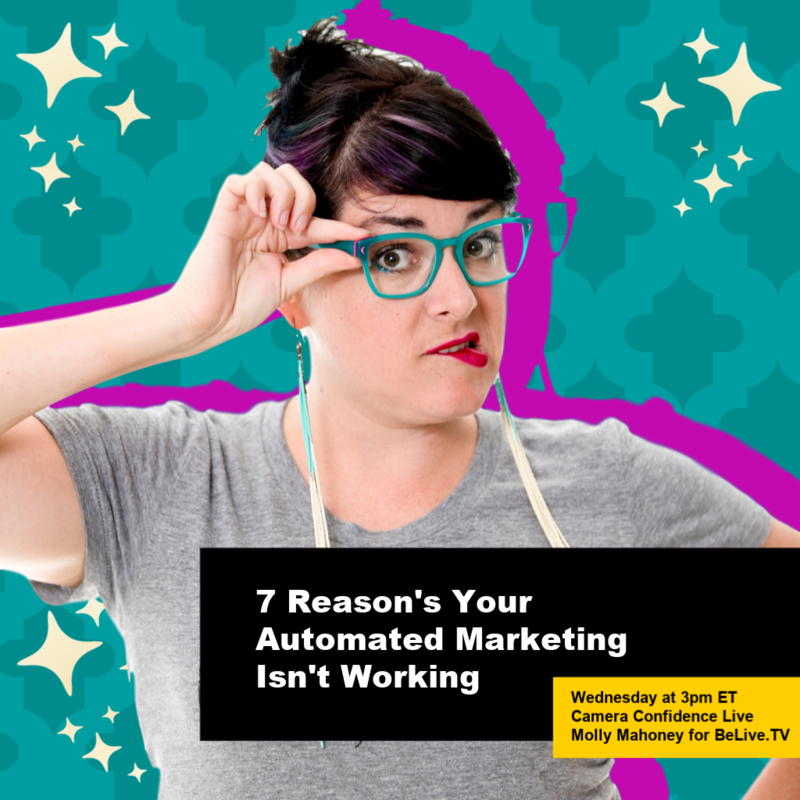 Automated marketing is not going to happen until you get organized and make your list… and then work your list. Reach out to your team. Reach out to your Coach. Reach out to your family members. There are all kinds of places to reach out to connect with other humans for support and the growth of your business… the missing part is the reach and asking for support. For example: reach out to influencers to share your new program; send them a direct message; stalk them (just a little bit 🙂 and find out whom might be able to introduce you in a comfortable way; be a real human and simply reach out. Your mindset is important for automated marketing to work well. It is all about change and having a mindset to adapt to that change versus being fixed and not open to change; It is a fun light read. If you have not read it yet pick it up! The point of the book is… if the cheese moves… move with it. Be adaptable. Be flexible. Be resourceful! Don't throw your hands in the air and complain that the cheese is no longer there (the cheese moving is like the situations in life changing). Make sense? You hold the power to your success in the palm of your hand. Be open to tweaking your system as you go.